First the gunmen surrounded the fishing camp in the hour of darkness before dawn. Next they opened fire, then moved in with spears to finish off the wounded. "They shot me in the arm and I fell, but as I was getting up they put a spear in my back," said Nyakong Gatwech, a 20-year-old pregnant mother. "They thought that I was dead so they left me." The attack on 2 August was carried out by fighters from the Murle ethnic group in the remote region of Jongeli state. 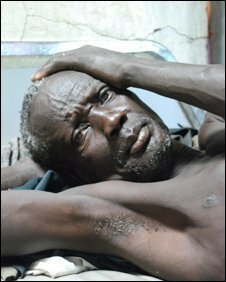 It was one of the worst single outbreaks of violence in South Sudan since the end of the civil war four years ago. Officials say at least 185 people died, mainly women and children. These kind of attacks are becoming increasingly common in the troubled south, a region still recovering from decades of war with the north. It was one of Africa's longest conflicts. The few wounded survivors of the attack recounted their experiences as they recovered in a basic hospital in the town of Akobo. "They shot me in the leg, but I made it to the river and I hid until they had all gone," said 10-year-old Dobol Jok. His father sat by his bedside and watched in silence. Dobol's younger brother was speared to death. "It was a clear massacre," said Akobo Commissioner Goi Jooyul Yol, who visited the site of the attack. "We saw children and women lying floating in the river," he added. "I am wondering why people would do this to innocent children." It is a situation that is causing deep concern. Fighting is common in the region, often over cattle or land, but an upsurge in violence has left many in shock. Even the unit of soldiers sent to guard the group as they fished could not provide protection - 11 were killed in the attack. Many of those targeted had fled to Akobo in April after earlier clashes, but had returned in search of food. Akobo has been accessible only by air for months, with its roads closed by heavy rain and its river route blocked by hostile neighbours upstream. The last river convoy of 700 tonnes of UN food aid was stolen or sunk by gunmen in June. The military convoy was killed. "We needed to fish because we have no food," said Nyakong Gatwech. "The soldiers were sent to protect us." The United Nations say that more have died in the south in recent months from violence than in the war-torn western region of Darfur. Many in the south blame former civil war enemies in the north for encouraging the attacks. "There are definitely indications of the hand of the north," said Commissioner Yol. He said cattle herders had reported sighting "unknown aircraft" landing on unmarked airstrips in the remote region and offloading cargo. But they could not provide further details. There are fears the north wants to destabilise the oil-rich south ahead of a 2011 independence referendum, which many believe will see Africa's biggest nation split in two. Distrust remains high between the two sides, still divided by the religious, ethnic and ideological differences over which the civil war was fought. Officials have vowed to open the river route, increase supplies and to beef up security. But the youth of Akobo are itching for revenge. "We cannot sit back and let our enemies knock us down," said James Gatwech, a young man in a market empty of basic supplies. "If they kill us, we will kill them."